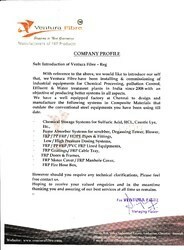 Established in the year 2008, Ventura Fibre, is one of the prominent Manufacturer and Supplier of FRP products including FRP Manhole Cover, FRP Pipes and Fittings, FRP Ladders, Fibreglass Ladders, FRP Acoustic Enclosures, FRP Office Cabins, FRP Scrubber, FRP Roofing Sheets, FRP Ventilators, FRP Hosing, FRP Dust Bins, Fabricated FRP Lining, MS Tank FRP Lining, FRP Fire Hose Boxes, FRP Gutters, FRP Rain Water Gutters, FRP Dosing Tank, FRP Filter Tank, FRP Lining Tank, FRP Septic Tank, FRP Pultruded Gratings, Ductile Gratings, Heavy Duty Gratings, Electroforged Gratings, Stainless Steel Gratings. Engaged in manufacturing an optimum range of products, we have built a strong foothold in the market. We procure best quality basic material from trustworthy vendors thus, we are capable of providing superior assortment. Our range finds its application in Chemical, Civil, Mechanical, Electrical and Automobile Segments. Backed with a well versed team of professionals, we offer our range that is known for durable finish and strength. Being a client centric organization, we believe in providing utmost satisfaction to our clients. All our products are subjected to strict quality control tests, which ensure best quality in them. Moreover, owing to the expertise of our team, we are also able to undertake Site Fabrication, Installations, Inspection and Repair work. We owe the success of our company to our mentor Mr. Vijay Bharathi. With an immense expertise in the domain, Mr. Bharathi has helped us in gaining a strong client base. Under his able guidance, the company has witnessed tremendous growth in a very short span of time. We are looking for Enquiries from Chennai, Tamil Nadu. Owing to these features, we have been able to build a strong foothold in the market. We owe the overwhelming success of our firm to our well versed work force. We have with us, a team of 250 skilled professionals, which helps us to deliver an optimum range of FRP Products. Manned by proficient engineers and technologists, we have been able to undertake Site Fabrication, Installations, Inspection and Repair Work as well. Owing to the above mentioned features we have been able to carve a niche for ourselves in the market in a very short time span.